After we made our superhero Mother’s Day Gift last month I knew right away we’d have to revisit the idea for Father’s Day. After all, Dad’s have some mega super powers just like Mom’s do, don’t you think?! This Super Dad Father’s Day Gift idea is going to make Dad feel super special on Father’s Day. We’ve included a message that kids can personalize on the back of the Father’s Day gift so they can share what they feel makes their Dad extra SUPER. 1. Begin by downloading and printing out the Super Dad Father’s Day gift template. You can either print this all out on white paper and have children color in all of the pieces on their own. 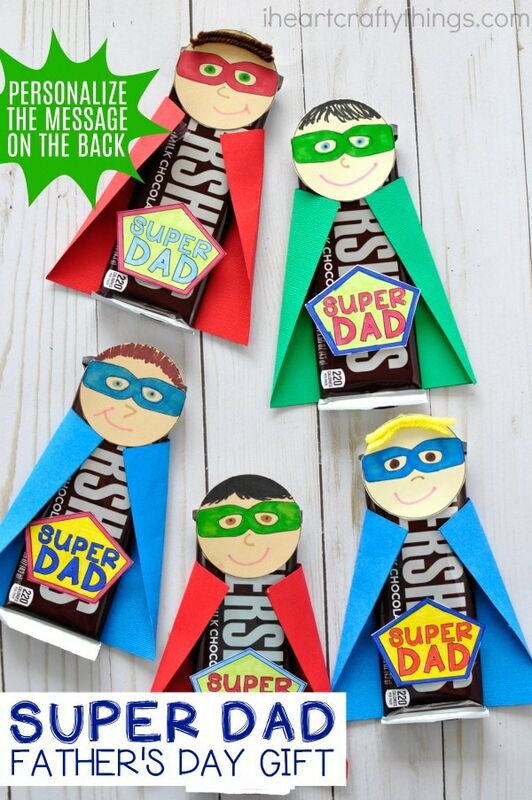 Or you can print out the Super Dad capes on colored cardstock and the face template on a skin tone colored cardstock. We did this option at home but in a group setting where ethnic traits may vary, it would be beneficial to go with printing the faces with white cardstock so the children can color in the skin tone how they choose. 2. Cut out all of the template pieces. Use your markers (or crayons) to color in the the Super Dad badge and the Super Dad face. On some of our examples we used yarn for hair. This is optional. 3. 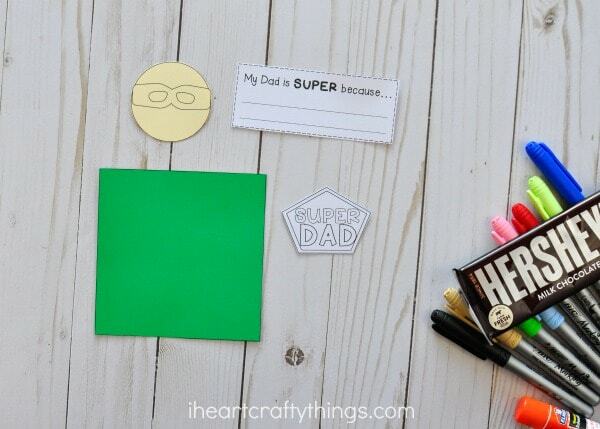 Personalize the Father’s Day gift label by completing the sentence with something “super” your Dad does. 3. Lay the Hershey’s chocolate bar on top of the superhero cape aligning the chocolate bar with the bottom of the cape. Fold down the top corners and make creases along the cape to form the cape around the chocolate bar. 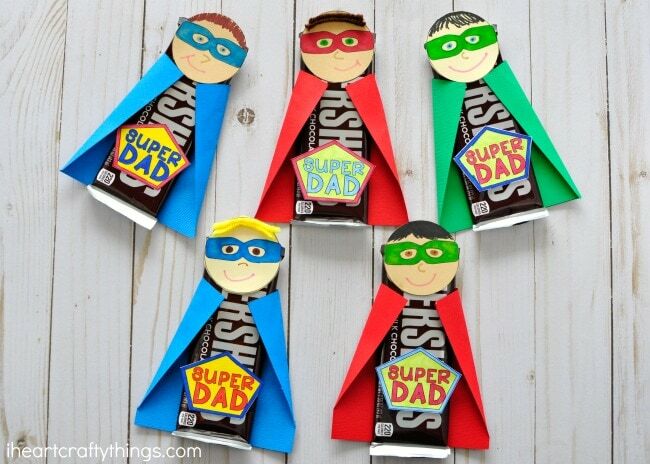 Add tape to the superhero cape and lay your chocolate bar down onto it. 4. 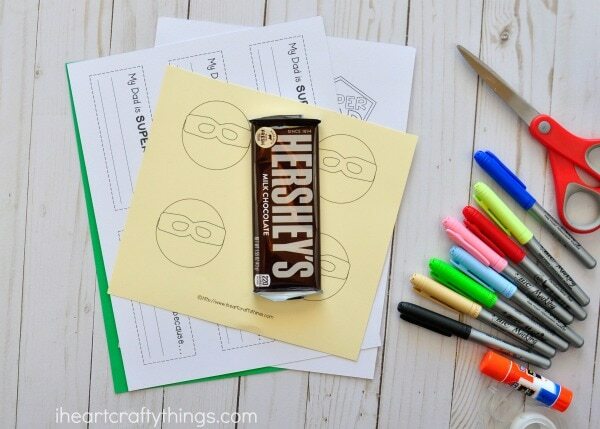 Add a piece of tape at the bottom of the chocolate bar and at the top of the chocolate bar and attach the Super Dad badge and the face. 5. 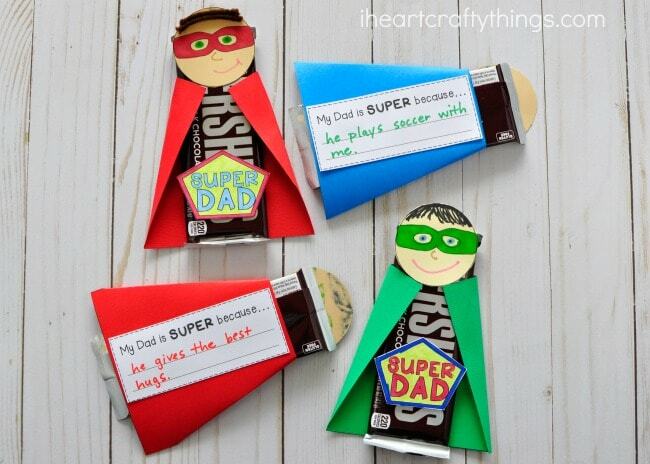 Use a glue stick (or tape) to attach the Super Dad Father’s Day gift tag to the back of the superhero cape. 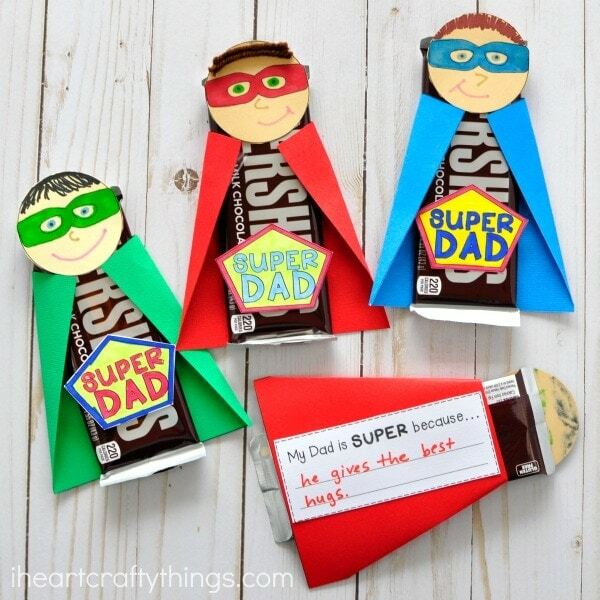 Now your Super Hero Father’s Day Gift is all ready to give to your Dad on Father’s Day. He is sure to grin and feel like a superhero! 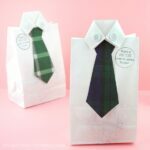 Did you see how we made this idea into a fun gift for Mother’s Day too? 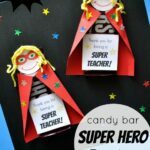 Or how about surprising your child’s “super” teacher with one as well! Looking for more awesome Father’s Day inspiration? Check out this adorable Guess Whooo Loves you Father’s Day card or this Father’s Day card for an “Out of this World” Dad or Grandpa. One of our friends made the most adorable “Hooked on You” Father’s Day card too! As always, Thank you Rachel! 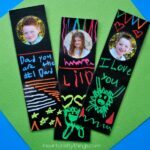 Thank you these have been a great idea for the dads at Messy Church. I love this craft, thank you for sharing! Just an idea, but many children today are coming from non-traditional families. Maybe you could add a template for “My GUY is super because” that could be given to the Grandpa, Uncle or any other father figure that has stepped up to be the male presence. And maybe “Super Dad” could also have a “Super Man” addition. I know at mothers day one of our littles didn’t want to participate and was quite sad bc mom was not in her life (but there was a mom figure).